3D Biomatrix’s Perfecta3D Hanging Drop Plates Now Available through Fisher Scientific in the U.S.
3D Biomatrix, which develops and sells tools for drug discovery research and testing that mimic the human cellular environment, announced today the availability in the U.S. of its 96- and 384-well Perfecta3D® Hanging Drop Plates through Fisher Scientific. 3D Biomatrix's Perfecta3D Hanging Drop Plates, in 96- and 384-well formats, facilitate the formation, culture, and testing of 3D spheroids. Listing our Hanging Drop Plates with Fisher Scientific, as well as with our other U.S. and global distributors, makes ordering even easier. 3D Biomatrix, a leader in three-dimensional (3D) cell culture products, is pleased to announce today that its 96- and 384- well Perfecta3D® Hanging Drop Plates can be purchased from Fisher Scientific in the United States (Fishersci.com). Perfecta3D Hanging Drop Plates facilitate the formation, culture, and testing of 3D spheroids in a well-plate format without the aid of coatings or matrices. Spheroid cultures grown in Perfecta3D Hanging Drop Plates allow researchers to easily mimic tissue metabolic and proliferative gradients, capture complex cell-matrix and cell-cell interactions, conduct co-cultures, and monitor cell growth easily and regularly. Spheroid formation is controllable and easy with Perfecta3D Hanging Drop Plates. Users simply pipet a cell suspension into each channel; the channel shape causes the drop to securely hang from the bottom of the well. As cells do not contact any surfaces, they aggregate into a spheroid. One spheroid forms per well, and the spheroid diameter is controlled by the cell type and number of cells added to each well. Media and compounds can be added or removed from the top of the plate without requiring new equipment, and cells can be added for co-cultures. 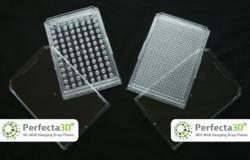 Information about the Perfecta3D Hanging Drop Plates can be found on the 3D Biomatrix website. The Fisher Scientific catalog numbers for the 96- and 384-well plates are 50156273 and 50156272, respectively. Contact information for Fisher Scientific and other distributors can be found at the 3D Biomatrix website.